You cannot beat a holiday to Ireland, be it Ulster or Eire. I have enjoyed trips to Dublin, Sligo, Donegal, Enniskillen and Belfast over the years. Every visit is a treat. The people, the history, the landscape, the food and drink (especially the drink) and the literary and cultural heritage all combine to make holidays special. Musically, Irish composers tend to be less-well-known than their English counterparts. There is no Irish Elgar, Vaughan Williams or Britten. Yet, scratch the surface, and there are Irish composers a-plenty. Some write music that is challenging, others compose to delight. This new recording tends toward the latter. It is a splendid exploration of music written by Irish men and women or those inspired by that country. The opening work needs little discussion. Arnold Bax, was English, but could be regarded as an honorary Irishman or Celt. His beautiful Clarinet Sonata in D major, composed in 1934, is one of my favourite pieces for that instrument. This two-movement work explores a musical language that owes more to Strauss, Debussy and Scriabin than to any overt Irish influence. However, to my ear, the music is chock full of the Celtic Twilight. This is a challenging piece for clarinettist and pianist, with lots of chromaticism and a thick, complex and often intense piano part. It has been suggested that some of the ‘concentrated’ piano writing may be an acknowledgement of Bax’s long-term love affair with Harriet Cohen. The premiere of this work was given at a London Contemporary Music Centre concert at Cowdray Hall on 17 June 1935. The clarinet soloist was Frederick Thurston, with the piano part played by Cohen. 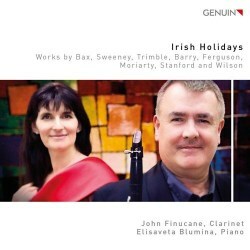 Eric Sweeney’s Duo for clarinet and piano (1991) is a delight. Apparently, the composer used to utilise serial techniques and extended tonality, before having an ‘Epiphany’ in the late 1980s. His style now appears to be a fusion between Irish folk music and minimalism. It is an exciting and enjoyable piece. Equally charming is Enniskillen-born Joan Trimble’s short atmospheric The Pool among the Rushes for clarinet and piano, written in 1940. It follows an old Irish tradition of naming works after everyday places. My only regret with this piece is that it is too short. I should have liked it to go on for ever. Barry’s other piece, Low for clarinet and piano was composed in 1991 and written for the present soloist John Finucane. Here, the composer seems to get in the groove, with a jazzy, ragged melody with an equally fraught accompaniment. The work explores all the contrasting registers the clarinet: it is certainly not gentle on the mind, but an enjoyable piece all the same. I have always enjoyed Howard Ferguson’s Four Short Pieces for clarinet and piano, op.6 (1932-36). The movements are entitled ‘Prelude’, ‘Scherzo’, ‘Pastoral’ and ‘Burlesque’. Once again, they suffer from being too short, although they are near perfect miniatures. James Wilson’s Three Playthings for clarinet solo is a bit of a misnomer. These are not quite as much ‘bagatelles’ as the title may suggest; in fact, they are often quite serious. There are some interesting instrumental effects, especially in the long-ish opening movement. The music combines features of lament, jig and folksong. They were composed in 1983. This is another Englishman’s take on Irish music and none the worse for that. The final work on this CD is Christopher Moriarty’s Opaque Rhapsody for clarinet and piano. It was composed in 2016 for his teacher, the present soloist, John Finucane. I am not sure what the underlying concept is, but it is certainly an impressive and eclectic piece. The liner notes explain that extracts from the ‘Dies Irae’ are heard, first in the piano, pounded out on the lower registers, then in quieter mood on the clarinet. The connection is not explained. There are plenty of colourful effects for both players which are enthusiastically played. The playing on this CD is superb. John Finucane and Elisaveta Blumina engage with a diverse variety of styles and mood, providing an effective and varied repertoire. The recording is ideal, with all the nuances of the clarinet (and piano) clearly heard. Thomas Böttcher has provided a set of readable and informative liner notes. There are the usual biographies of the two performers. This is an excellent introduction to music for clarinet and piano, written by Irish or English composers, but inspired by a broad range of musical influences. The performance of the Stanford, Ferguson and Bax is the heart of this CD, but the other works are worthy of gaining a place in the repertoire of all clarinettists and their accompanists.